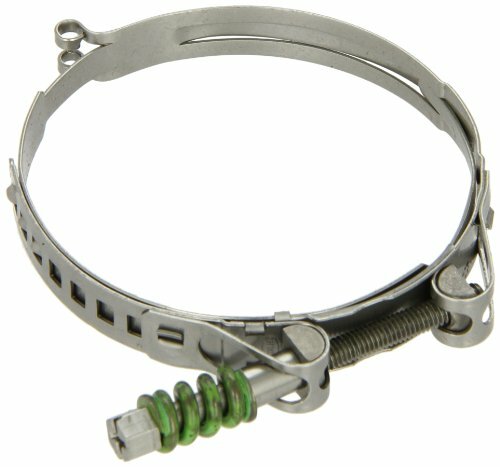 This Oetiker 178 Series stainless steel bolted self-tensioning Stepless hose clamp is for clamping coolant lines. This clamp has a screw-type tightening mechanism that enables it to fit onto a broader range of hose diameters than the same size ear clamp. The tightening mechanism is self-tensioning for accommodating changes in diameter due to thermal cycles. The narrow band of the clamp concentrates clamping force in compliance with Type SSCP hose clamps as defined in standard J1508 of the Society of Automotive Engineers (SAE). It's made of stainless steel for resisting scaling and corrosion. This clamp is suitable for attaching hoses to fittings or other devices for applications such as food processing and commercial fishing that involve exposure to corrosive elements, particularly salt water.